The H160M, the military version of the H160, was chosen in 2017 to be the standard aircraft for the French armed forces’ Light Interservice Helicopter (Hélicoptère Interarmées Léger – HIL) programme—a significant choice in renewing and streamlining the fleet of the French State, Airbus Helicopters’ biggest customer in number of aircraft. The French State has a large fleet of helicopters, with a total of 578 helicopters, 480 of which are in the service of the Ministry of Defence and 98 with the Ministry of the Interior. However, over the years, the increasingly wide range of missions entrusted to helicopters has led to several families of specialised aircraft, resulting in a heterogeneous fleet. Some of the State’s ageing fleet require a greater amount of maintenance, especially as field operations, which are both numerous and long, have a significant negative impact on the fleet’s state of repair. The French Military Planning Act (LPM) of 2019-2025 states that the future Light Interservice Helicopter programme (HIL) shall replace five fleets among the three armed services with a standard platform, the H160M. This programme is due to be launched in 2022 and is expected to have numerous benefits: gains in terms of capacity, fleet standardisation, reduced operating costs, reduced logistical footprint and increased operational availability. Modular and versatile, the H160M can be used for a wide range of missions, from training to light transport, including surveillance, armed reconnaissance and intervention, alongside specialised aircraft including the Tiger and the NH90. 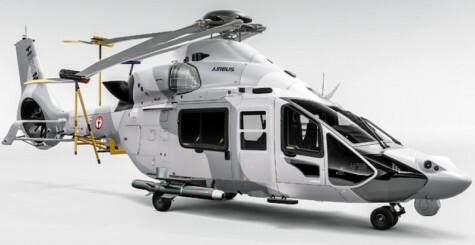 With the benefits of the H160’s digitised development, the simplification of maintenance was prioritised from the aircraft’s early design phases, ensuring better accessibility to each area of the aircraft and focusing on the idea of maintenance “in the field.” On each occasion, tests were carried out on test benches, prototypes and with the “operator zero” concept in order to check the operational success of maintenance tasks. This work will ensure the aircraft’s maturity when it launches on the civil aviation market and, a few years later, when the H160M is first used by France’s armed forces. The embedded “testability” concept, digital ground tools, and data recording capacities will make it easier to diagnose and manage the fleet’s airworthiness. Benefiting from EASA certification on the civil variant, the H160M will ensure lower support costs, based on the requirements of civil aviation operators. Within the armed forces, a single fleet will also make it possible to combine efforts in terms of training, technical support and spare parts management. All of these features are currently being discussed by the French State and Airbus in order to quantify the expected gains while optimising availability. This work will lead to a review of the support chain in its entirety from next year, with the aim of providing a real departure from previous ideas. The first H160M orders as part of the HIL programme are expected in 2022; orders will be delivered after 2025. The current target is around 180 aircraft. The H160M’s speed, autonomy and planned configurations ensure its ability to work in close collaboration with more specialised aircraft, including Tigers and NH90s. The H160M’s level of performance and the inclusion of new equipment will also enable the armed forces to develop innovative uses for their aircraft.